Last week, I went on vacation. This was, in and of itself, a sort of milestone. The last time I went on a proper vacation was in 2008. What do I mean by a "proper vacation?" Well, I had gone on a couple of trips in the past 10 years to the US to visit friends, but I also took my computer with me and worked, regularly, on those trips. I also took a few long weekends for spinning or knitting events. I don't count that as a "vacation" because (a) it's just a long weekend and (b) I sometimes took work on those events and (c) I was often there to do workshops and learn things, which can be a lot of fun, but it isn't the same as a do-what-you-want-when-you-want vacation. Last week was one of those weeks, and it was marvellous! I went to Prince Edward Island, which is the province next to mine, to spend the week in a lovely seaside cottage which I shared with my parents. Marc also came for the first day and a half of the vacation, which was good because he doesn't usually go on vacation either, but he also wanted to use some of his time off for his own projects in the garage, so he only stayed for a short time. I have all sorts of things I want to blog about, but I'll just blog today about the first day of our vacation. On Monday morning of last week, we headed off under sunny skies to the Confederation Bridge. That's a bridge that goes from New Brunswick to Prince Edward Island. I was driving the car and Marc was on his motorcycle, so I couldn't take pictures of the bridge, but here's one from Wikipedia for you. The bridge is 12.9 kilometres long (that's 8 miles!) and is a multi-span balanced cantilever bridge that ranges from 40 to 60 metres (131 to 197 feet) above the water. It's the longest bridge in the world that crosses ice-covered water (obviously not at this time of year). It takes over 10 minutes to drive across it. We didn't have to be at the cottage until 4 pm, so we decided to visit a historical site called Roma at Three Rivers. It's the site of a French trading post that was established in 1732 and which was unfortunately burned down by the British in 1745. Not my ancestors I hope! We enjoyed lunch there and toured around the buildings and the heritage garden site. The building where we had lunch is built in the style of the original main building which would have been the original sleeping quarters for about 70 settlers. There is a replica of an Acadian "chaloupe" - a type of fishing boat used in the original settlement. I enjoyed looking at all the plants in the garden, and I liked the sturdy fence. The restaurant had a lovely herbal iced tea made with bergamot (bee balm), lemon balm and something else from the garden...I think it was rosemary but I'm not sure. Marc enjoyed investigating the huge clay oven that is in daily operation at the site. Since we had almost 2 hours to spare, we decided to go on one of the walking trails at the site. We chose a 3 km trail that we thought would be easy to complete with time to spare to get us to the cottage. Unfortunately, vandals had broken and obliterated many of the interpretive signs along the trail. 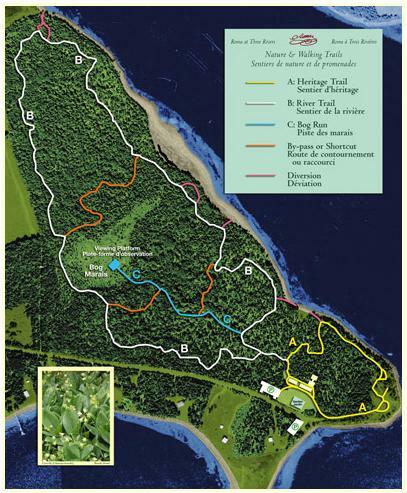 However, the trail itself was a beautiful, peaceful walk through a forested headland. There was a remarkable array of mushrooms through the woods, including some that were obviously boletes (which are edible). I was captivated by their massive size. Here's a picture of some of them with my lens cap for scale. I loved the massive tree trunks and couldn't help but embrace my tree hugger personality on the trail. After a while though, we ran into a lot of trail obstacles - downed trees from various storms, areas of difficult walking, and a few other issues, so we decided to take a shortcut. On the map below, we were on the white line trail "B" on the right hand side, expecting to do the full loop. Instead, we crossed at the orange marked trail that cuts the northern portion of white trail "B" out, and leads back to the start. Well, we crossed that orange trail expecting to see the white tree markers that indicated the other side of trail "B" but unfortunately, they were nowhere to be found. We wandered around in circles desperately seeking the trail to no avail. There wasn't any signage to be found. I tried to use my cell phone to find the trails on the map, but no dice. Growing increasingly concerned, we had no choice but to double back, taking the orange trail back across the middle and returning to the start via the same part of trail B that we started on. It was quite a long delay and involved me losing a shoe several times in the boggy area at the bottom of the orange trail, and both of us getting quite flustered. This resulted in us being more than an hour later than expected for our arrival at the cottage, which no doubt caused some concern to my parents who were expecting us at 4 pm, but at least we didn't get entirely lost and spend the night in a bog. And I got a lot of really great pictures of interesting fungi. More about the rest of the holiday soon! Ugh. Sounds like the vandals destroyed the trail markers too, eh? Jerks. Well, at least you had some fun. LOVE the photo of you hugging the tree! Not an auspicious start to your vacation! And you destroyed my utopian opinion of Canada being a kinder, more polite society where everything is more respected than it is here.... Or are you just trying to discourage the millions of us who have been thinking of fleeing Trumplandia??? Goats! Sheep! Llamas! Farms! Yay! Claire Moxon-Waltz. Simple theme. Theme images by chuwy. Powered by Blogger.